Learn how Day One's reminders and templates can help you make a habit of journaling. Reminders do not sync between devices. Each device will need to set up reminders individually. To create Reminders, go to Day One > Settings > Notifications & Reminders > Add Reminder. You can adjust the settings of one or multiple reminders. 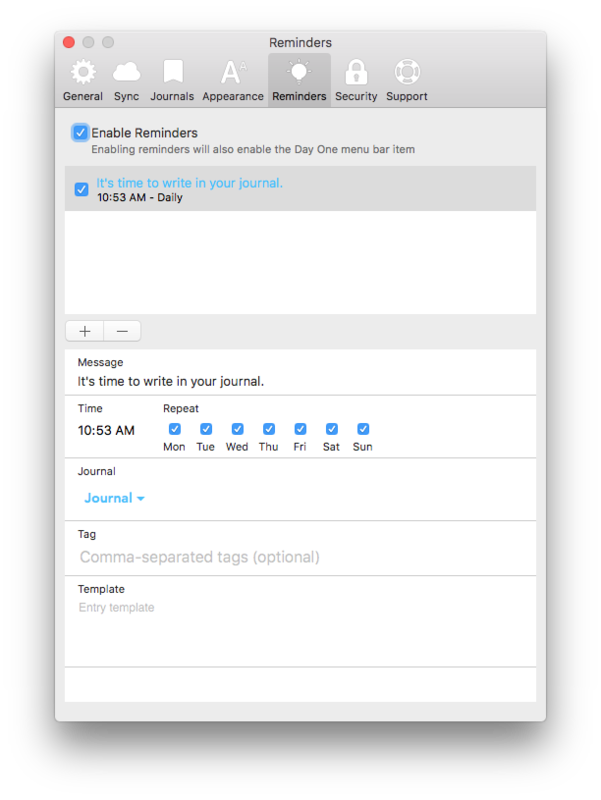 You can have a custom message appear, choose the time, recurrence, to which journal the entry will post, tags, and even templates. When the reminder appears in your notifications, tap on it to load the entry. Templates are loaded into the entry when you tap the reminder as it appears or tap the reminder in the Notification Screen on iOS. Click Day One > Preferences (in the file menu) > Reminders. Click to enable reminders and then click the + icon to create a new reminder.